I was at Dollar General recently and found some LA Colors. I think this brand is alright. I think their colors are a bit generic. They are not the most original with the exception of Blue Paradise. It's a nice brand for $1 though. I don't complain much if it has a low price! Nectar. 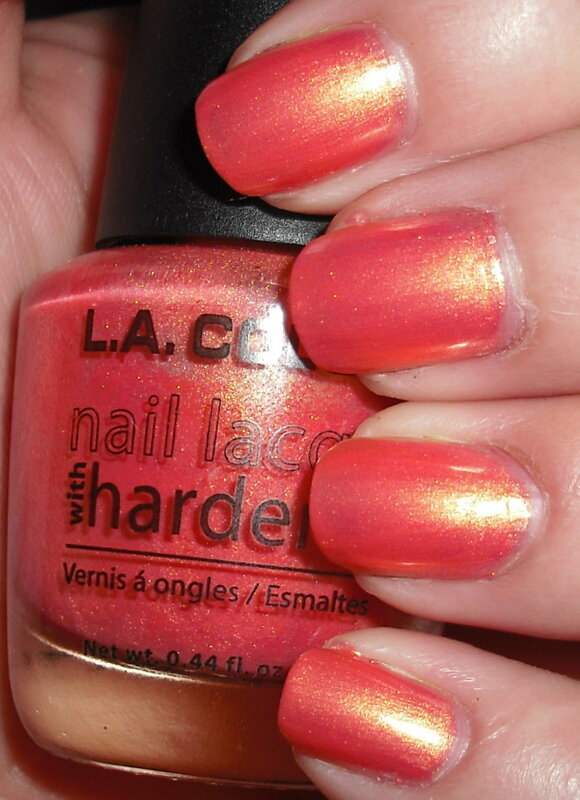 Is a peachy-pink with a ton of golden shimmer. I normally LOVE these shades. Gold shimmer is one of my favorites. I like this shade, but it's not my favorite. This color seems to channel Miami 1985 to me. It's bit too Golden Girl's Blanche Devereaux. I don't know if it's the base color or the amount of shimmer. The color itself is beautiful, but something about it seems dated. It could be just me though? I love gold shimmer too. It can make an ok polish amazing. But I see what you mean about this being dated. Maybe I'd like it more in the summer, but I guess it's still pretty warm in Florida, right? i love this polish! try making it matte to give it a fresh new spin! Hi girl, I love your blog so I tagged you! HMMMPH! I'll have you know that I have this shade and it's one of my favorites. In fact, this shade is so amazing, you'll win blog awards for wearing it. Well, would you look at that! See!